Despite surging 165% higher in the past 12 months, this stock looks poised to continue to be an outperformer. I realize this is a bold move. But I'm calling Shopify (NYSE:SHOP) my top stock to buy in October -- even after its massive surge in its stock price recently. Shares are up a whopping 350% in the past three years, 165% in the past year, and 65% in the past six months. Yet I think there's still room for Shopfiy to run. Sure, Shopify stock's strong run-up comes even as the e-commerce platform company hasn't achieved profitability yet. Furthermore, the company's net loss has widened significantly in recent quarters. But a close look at Shopify's business reveals a fast-growing, scalable, and adaptable platform with a business model likely to become very lucrative over the long haul. Data source: Shopify second-quarter earnings release and Morningstar. Table by author. Shopify's surging revenue is one of the primary reasons I believe the company can grow into its valuation. Revenue in the company's most recent quarter was up 75% year over year. But where Shopify really shines is its outsize growth in gross profit, making a strong case for the company's scalability. In the same period revenue increased 75%, gross profit climbed a sharper 83%. Of course, Shopify's trailing-12-month net loss of $46 million highlights one of the company's challenges: It hasn't hit profitability yet. But a rising gross profit margin as Shopify benefits from its scalable business model should help the company eventually serve investors handsome profits. In Shopify's most recent quarter, for instance, the company's gross profit margin of 57.3% was meaningfully higher than its profit margin of 54.8% in the year-ago quarter. 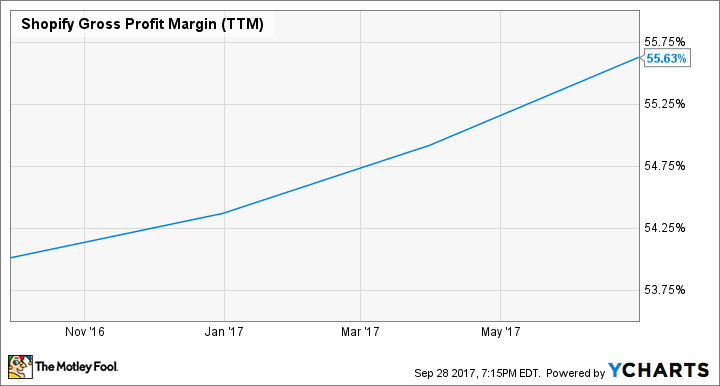 Similarly, Shopify's gross profit margin is improving on a trailing-12-month basis. Shopify's biggest opportunity lies in ongoing growth in its large addressable market of essentially anyone or any company that wants to make money online or to streamline existing back-end e-commerce solutions. This includes individual entrepreneurs, small and midsize businesses, and even the world's largest brands. Shopify is gaining traction in all of these markets, with total merchants on its platform at 500,000 -- more than double the number it was serving at the beginning of the year. In addition, Shopify recently articulated a handful of key tailwinds and opportunities poised to support sustainable growth for years to come. As tailwinds, Shopify cites the rise of self-employment, e-commerce growth, and the consumerization of the enterprise (the simplification of enterprise software to remove pain points for end users). As opportunities, Shopify lists international markets, share of wallet (the percentage of a customer's total spending that Shopify captures), and machine learning. Fortunately, Shopify is not only positioned amid some significant tailwinds and opportunities, but it has the competitive advantages to keep competitors at bay. Shopify's primary advantage is in the network effect associated with ongoing customer growth. Fast-growing customer adoption keeps Shopify at the forefront of businesses' ever-changing challenges. With its adaptable software-as-a-service, cloud-based model, Shopify can quickly evolve current offerings and launch new ones. Further, Shopify has fueled its network effect by working closely with partners, including app developers for its app store, agencies as Shopify experts, and theme designers to build themed Shopify stores. Shopify COO Harley Finkelstein explained the immense benefits of its partner system in the company's second-quarter earnings call (via a Reuters transcript). [T]he large number of partners that are building on and for our platform are a key differentiator. Scale makes a difference here. The number of submissions through our app store in Q2 doubled over last year, and those that get approved are making the app store more valuable to merchants overall, as reflected in the continued increase in app spent per merchant. In addition, Finkelstein noted that partners also end up serving as a key source of referrals. Thirteen thousand partners referred merchants to Shopify in the past 12 months. Finally, Shopify also has a strong competitive advantage in its customer switching costs. By continually launching new products and services and executing a land-and-grab strategy that gets customers increasingly more invested, customers can't switch to a new platform easily. Shopify's biggest risk is that other competitors, such as Square and Salesforce, gain inroads on Shopify's e-commerce platform expertise and grow their competing offerings rapidly enough to erode Shopify's competitive advantages. If competition can eat away at Shopify's market opportunity, the company's premium valuation could become a stumbling block for long-term results. Shopify has a price-to-sales ratio of 20.7, well above the average ratio of software application peers of 5.7. Ultimately, I believe Shopify's recent performance, strong tailwinds and opportunities, and its leadership position as the go-to platform for building back-end e-commerce solutions outweigh these risks. Shopify stock looks like a solid investment opportunity with significant growth ahead.